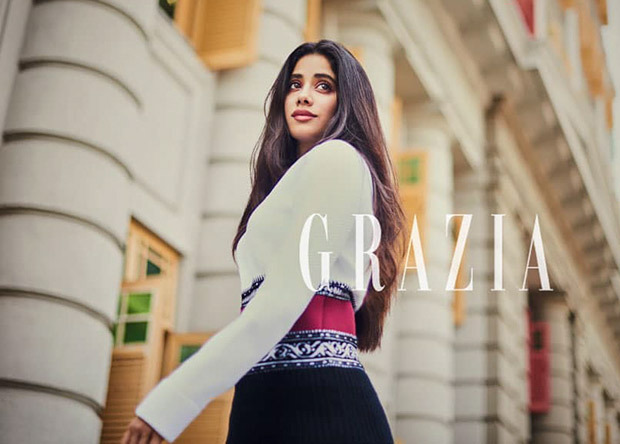 HomeCinemaMasalaGrab some fabulous style lessons from the millennial Grazia cover star, Janhvi Kapoor this month! This feisty millennial made her big Bollywood debut with Karan Johar’s Dhadak this year. She also made her runway debut for feted fashion designer, Nachiket Barve at the recently concluded Lakme Fashion Week Winter Festive 2018. Late Sridevi and Boney Kapoor’s eldest daughter has hit the genetic jackpot of good looks, grace, and poise. Additionally, she keeps us hooked to her shenanigans, enjoying a tremendous social media presence. The 21-year old millennial’s style book comprises all things snazzy, breezy and chic. 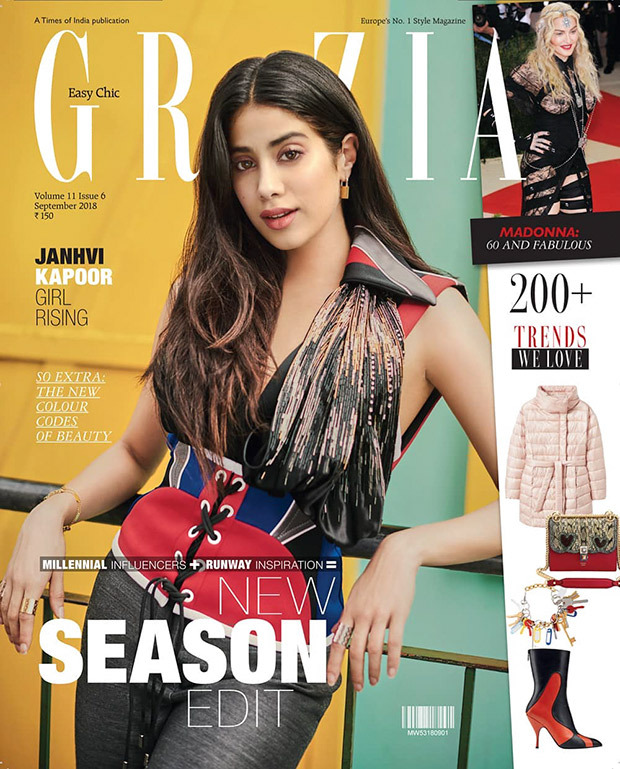 The rising millennial star and a style icon, Janhvi Kapoor doles out all that’s close to her heart as the cover star of Grazia this month. With the promotional style for Dhadak, Janhvi Kapoor in tandem with her fashion stylist, Tanya Ghavri showed us the unconventional ease of flipping styles – neo-ethnics, traditional and western ensembles. Speaking about her co-star Ishaan Khatter, acting in movies and her character in Dhadak, Janhvi Kapoor spills it all in this edition. Playing muse to all kinds of designer ensembles, the photoshoot has been lensed by Micky Won and styled by Pasham Alwani. The glam squad features makeup artist Yang Rick and hairstylist Roy Sng. Here is a closer look at the photo shoot and the pictures from the photoshoot. Janhvi wears an embroidered bustier, tuxedo trousers, ‘Lock Me’ earrings, ‘Trio’ rings, all Louis Vuitton. She rounds out the fuss-free look with textured hair and a subtle makeup. Janhvi is seen sporting a knit bodysuit, tuxedo blazer, sequinned trousers, ‘Lock Me’ earrings, ‘New Wave Noir’ bag, ‘Headline’ pumps, ‘Trio’ rings, all Louis Vuitton. Janhvi sports a belted jacket, track pants, ‘Headline Cross’ pumps, and ‘Thelma Louis Gold’ sunglasses from Louis Vuitton. Janhvi is seen wearing a woven knit from Louis Vuitton in this picture. Janhvi Kapoor – All about Ishaan! Also Read: Janhvi Kapoor or Sara Ali Khan: Who pulled off the Manish Malhotra lehenga better? Janhvi Kapoor – On handling Fame! Janhvi is seen wearing an oversized A-line dress, trench coat, ‘Streamline’ pumps, from Louis Vuitton. On the professional front, Janhvi will be seen in Takht, a period drama by Karan Johar boasting of an impressive star cast featuring Ranveer Singh, Kareena Kapoor Khan, Alia Bhatt, Vicky Kaushal, Bhumi Pednekar and Anil Kapoor.